Get a Yakumo PDA Delta 200 Pocket PC 2002 for 279€ (should be available cheaper now), and install the ATARI ST emulator "CastCE" for Pocket PC 2002 (GAPI Version) from http://www.pocketinfinity.com, the Pocket PC tweak-tool "SpeedStepper" and the Turrican 1 oder 2 Atari ST rom. 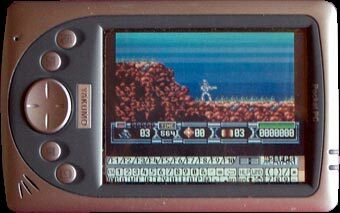 For full speed with perfect music Dexter recommeds a 400mhz yakumo xscale pda with pocket pc 2003, or an asus a620. 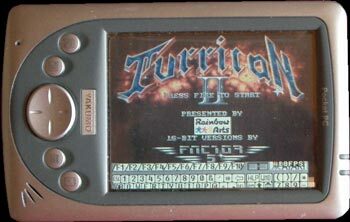 Turrican 1 and 2 graphically almost identical to the Amiga-Version in your pocket and it weights only 120 gramm.